I made the treasure chest from chocolate biscuit cake in 2 pans then covered them with chocolate flavored fondant then imprinted them with a wood grain mat. I wanted to have the chest slightly open but because of the weight of the chocolate biscuit cake it wouldn’t stay up no matter what I tried. I then decorated it with straps painted in silver edible paint and the keyhole and a little skull on the front. 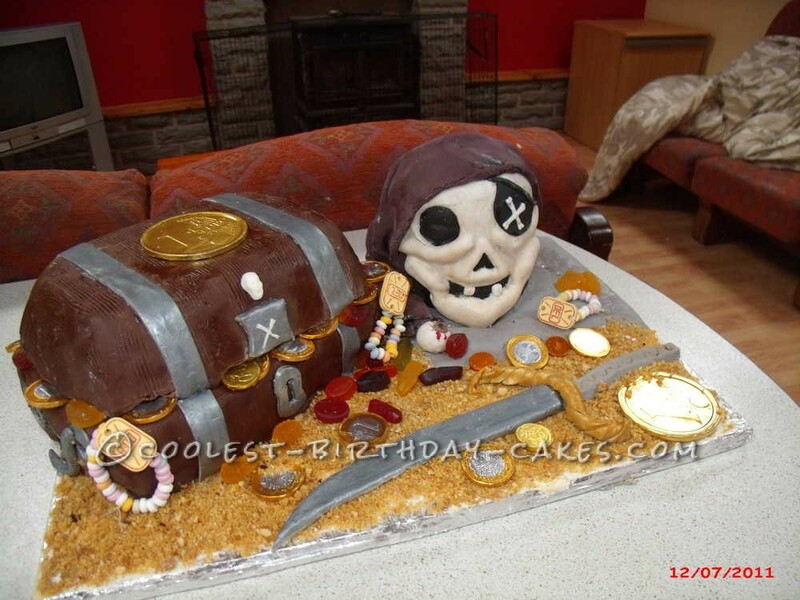 The skull was made from 2 lemon sponge cakes covered with lemon butter cream then covered in black fondant and then rolled bits of fondant into sausage shapes for under the eyes, cheeks and chins. Then covered all that in white fondant. I cut out the eye and mouth leaving some teeth in. I then mixed a little cocoa with water and painted it on to make it look aged the board is a piece of wood covered in tin foil then digestive biscuit smashed to look like sand. I then put the chest and skull on the board along with the sword which is made from fondant painted with edible paint. I then put chocolate covered gold coins and other sweets to look like treasure. My son loved this cake for his 5th birthday.